With over 9,000 live shows under their belt, Twisted Sister is celebrating its 30th anniversary this year and continues its unprecedented march towards rebirth with a hectic international touring schedule and a new Christmas album in the can and set for release on October 17th. Epiphone’s Don Mitchell recently caught up with Twisted guitarist Jay Jay French in New York. EPI: Why don’t we start with you bringing us up to speed on what’s happening with Twisted Sister. JAY JAY: Twisted Sister is continuing to headline major festivals around the world in our 30th year and frankly, it’s been phenomenal for us. We broke the all-time attendance record in Canada this year when we played an outdoor show for 80,000 people. The previous record was held by ZZ Top who did a show in front of 75,000 people. EPI: Did you have any idea there would be that many people in attendance? JAY JAY: No, not at all. In fact, we thought we would be playing for maybe 25,000. It ended up being more than three times that which was amazing. EPI: What’s it like to play in front of a crowd that large? JAY JAY: Well, to be honest with you it’s not all that different than a smaller show. Once you get past ten thousand the numbers are just mathematics and there’s not much of a difference. Your theatrical moves on stage can be a little bit broader but that’s about it. For me it’s not really the amount of people that effects me but how far away they are from the stage. You can have 80,000 people there but if they are being held back thirty feet from the stage you feel very disconnected form them. I like the audience up close. We’ve been averaging 45–50 thousand a show and have become pretty comfortable with that size crowd. Once you get to 80 or 100 thousand it’s just kind of this enormous mass of humans and all you can do is pray that there are repeater towers so people can see and hear. EPI: Still, it must be pretty awesome to play to a crowd that size. JAY JAY: Well, it is cool getting 80 thousand people to jump up and down at the same time! It’s quite a view from the stage and pretty amazing to see. EPI: Just make sure you bring a huge PA and monitor system right? JAY JAY: (Laughs) Actually, the minute the intro tape goes on I stick these special molded plugs in my ears and I can’t hear anything I do all night. I just play by instinct. Some of these stages have these long ramps out on the sides or over the PA system and I’ll be out there with no idea what is happening. (Laughter) You know, occasionally you might hear a hi-hat! Most of the time I just pray that I’m in the right song and that my solo is that songs solo! It really is about that ridiculous. Our sets are pretty much the same in that we know which songs we’re playing, so I key in on a group of three or four songs and try to make it back after that fourth song to see if I’m out of tune. I can’t tell because at 123 decibels it’s so unbelievably loud. I’m telling you, it’s like a gigantic work hazard zone so you wear these plugs and go out and perform and hope that you are somewhere in the key your supposed to be in. I know it sounds kind of funny but that’s how you play big time stadium rock. After a while you get confident in those situations but at first it can be pretty intimidating. EPI: I guess after thirty years Twisted Sister has it down! JAY JAY: We feel very fortunate to still be playing and having people enjoy what we do. Who could have predicted that we would be doing this thirty years later? We just did Rock Waves in Athens and it was cool because we were the headliner for the second year in a row. Nobody ever does that. We will be playing in Spain in October of this year. We’d never been to Spain before two years ago and now this is our fifth major festival there. We headlined a festival called Rock of Ages in Germany a few weeks ago and it was actually code named Twisted Forever, after us and that was an honor. We played our first major show in Bulgaria and played a NASCAR rally in Charlotte, North Carolina, which was a lot of fun. We played a county fair in Waukesha, Wisconsin that drew about 12,000 people. It just keeps getting better. EPI: That’s awesome and it puts you guys in some elite company to still be out there drawing old and new fans after thirty years. JAY JAY: It is awesome. On October 14th, Billboard is going to publish the Twisted Sister Thirtieth Anniversary issue which will be really cool for us and then on October 15th we’re being inducted into the Long Island Music Hall of Fame with Joan Jett, Billy Joel and the Gershwin Brothers which is a huge honor. EPI: Plus you have a new CD coming out? JAY JAY: Yes, “A Twisted Christmas” will be released on October 17th which is an album of us doing Heavy Metal covers of famous Christmas songs. EPI: That should be interesting. What made you decide to do a Christmas project? JAY JAY: Dee had mentioned in a meeting one time that “Oh Come All Ye Faithful” was an inspiration for “We’re Not Gonna Take It” and if you listen to the melody (sings first line) you’ll see what he meant. We thought it was pretty funny and started to imagine a whole album of Christmas songs done Heavy Metal style. There are ten songs on the album including Silver Bells, White Christmas, Have Yourself a Merry Little Christmas, Let It Snow, I’ll Be Home For Christmas, I Saw Mommy Kissing Santa Claus, Deck the Halls, The Christmas Song, and The Twelve Days of Christmas we renamed Heavy Metal Christmas. It’s re-done so it’s like twelve tubes of lipstick, eleven platform boots… that kind of thing…. (sings) five skull earrings, four quarts of Jack, three studded belts, two spandex pants, and a tattoo of Ozzie… you get the idea. It’s a really cool record. 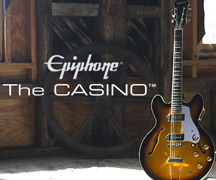 EPI: How are your Epiphones holding up? 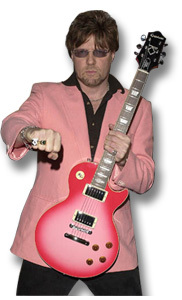 JAY JAY: You know my Pink Les Pauls have seen the world man. They’ve been photographed on the biggest stages in the world. There’s a photo in the Bang Your Head 10th Anniversary book that just came out that shows me with that guitar in front of 40 thousand kids. It should have a caption, “This is what a working man takes to work.” (Laughter) Honestly, Epiphones are the best deal on the planet. They play as great as the more expensive senior circuit Gibsons and my signature model is even better with the contoured back and Burstbucker pickups. They’re just great guitars. That’s all I play period. End of story. No matter where it is, no matter what country, I’m playing Epiphones and I love them. In addition to my signature model I have an Elitist ’63 DOT that has been incredible and I recently got an Alleykat that’s great. 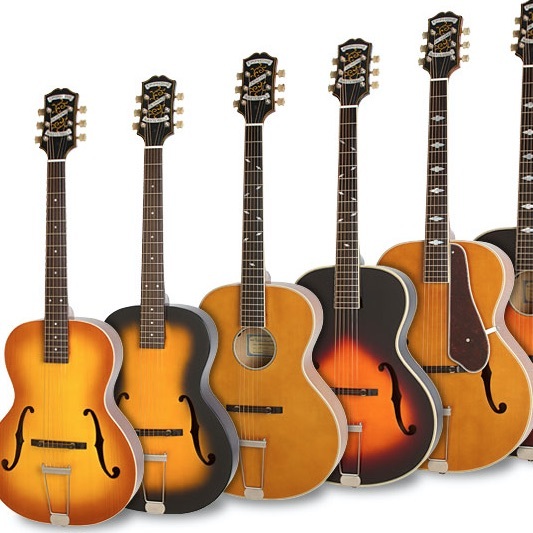 I think your company is putting out some of the best guitars in the business. They’re built amazingly well and I’m proud to be playing them. You’ll hear the Pink LP and the DOT all through the Christmas album so check it out. EPI: I will, and I can’t wait to hear it. Thanks Jay Jay for taking the time to chat and we’ll see you on stage soon! 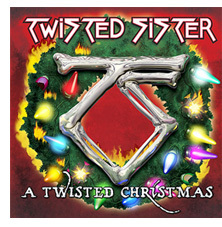 Visit Twisted Sister on-line at www.twistedsister.com.